Well, would you adam and eve it? The very week I suggested that Cristiano Ronaldo might be a bit miffed at only being considered the second best player in the world, he goes and wins the FIFA award as the world’s greatest player. His already inflated ego will have gone up another 50 psi (3.44 bar/344000 pascal if you want the SI equivalent) or so. The awards go to players, managers and even fans... Well done the supporters of Liverpule and Borussia Dortmund who shared first spot. I can’t believe Iceland only came third! Anyway, the votes are cast by players, managers, journos, fans and various folk around the world associated with the beautiful game. 23 players were short-listed for the final vote. Ronaldo came top with over 34 per cent and Lionel Messi was second-placed with 26. There was a huge gap between second and third with Frenchman Antoine Griezzmann on 7.5 per cent. Only two Brits made the final shortlist. Wales’ Gareth Bale came in at sixth spot pop pickers with 4.6 per cent of the vote while Englishman Jamie Vardy is at number 15 with 0.81 per cent. Orl right? Not half. [Apologies to any of you younger readers who don’t understand these references to Alan ‘Fluff’ Freeman’s style of presenting the charts. - Ed.] Well done lads. Vardy got the nod ahead of other notables Neuer, Ramos, Ibrahimovic, De Bruyne, Kante and Aguero. Even the World’s most expensive player, Monsieur Pogba only managed 19th spot. Dimitri Payet must be feeling properly deflated; he came last of the 23 nominees with 0.17 per cent of the vote. The voting system asks each player/manager/hanger-on to vote for their top three. Some of the results look a bit odd. Paul Pogba only received one vote as top choice; that came from a representative of Lesotho, of all places. The same thing happened with Aguero whose only top spot came from the Grenada rep.
Other telling votes came from England manager Gareth Southgate and France manager Didier Deschamps. Neither picked any player from his own country. It doesn’t say much about their opinion of their own teams. Another category was to compile a team of the year where a dream team of the eleven best players was chosen. Only one place in that team went to someone who played outside the Spanish league: goalkeeper Manuel Neuer of Bayern Munich. This strikes me as odd given that Neuer comes into the individual player category at number 16 whereas Juventus goalie Gianluigi Buffon is number 8. Lionel Messi voted for three of his team-mates as his top three players. Ronaldo voted for only one of his: Gareth Bale. If he’d had his way, Ronaldo would probably have voted for himself. Do I paint a picture of a vain man? My favourite category? This week’s title has already given that away. Yes, Leicester City’s Claudio Ranieri came top of the Men’s Coaches vote. Yay! Real Madrid’s Zinedine Zidane was second and the Portuguese national side’s coach Fernando Santos took third spot, in case you are interested. Well, done Signor Ranieri. Mark Marshall put Bradford in front after 22 minutes when he received the ball on the right from Josh Cullen and cut into the penalty area before scoring with a superb right-foot shot low into the far corner of the net. Ched Evans twice went close to equalising for Chesterfield. First, he took advantage of a mix-up between Bradford captain Romain Vincelot and fellow defender Nathaniel Knight-Percival (Cracking name of the week, methinks.) before slipping the ball out to Reece Mitchell on the left and then just failing to connect when Mitchell returned the ball into the box. He then latched on to former Bradford midfielder Gary Liddle's pass only to see his low, right-foot shot rebound off the post. Marshall and ex-Motherwell man Nicky Law then had shots saved by Ryan Fulton before Bradford doubled their lead in the 44th minute when Cullen's low cross from the right was met by the on-rushing Jordy Hiwula, who fired the ball into the net from close range. Ellis Harrison struck a hat-trick inside seven first-half minutes and ended with four goals as Bristol Rovers thrashed Northampton 5-0 at The Memorial Stadium. Harrison's first three strikes came between the 17th and 24th minutes as Rovers brushed aside the visitors, who showed little appetite for the fight. Rovers had taken the lead after seven minutes with a well-struck right-foot shot from the edge of the penalty area by Billy Bodin, which gave visiting keeper Adam Smith no chance. Harrison headed his first from James Clarke's right-wing cross and it was 3-0 to Rovers after 21 minutes as Chris Lines' corner was headed back across goal by Mark McChrystal and Harrison bundled the ball across the line from close range. Harrison completed his treble three minutes later when Lee Brown crossed from the left and the striker backheeled the ball into the net. The points were sealed when Harrison shot his fourth in the 54th minute. Full-back Harry Toffolo set the ball rolling in the eighth minute, finding the back of the net with a deflected shot from 25 yards. After 19 minutes they doubled their lead when former Bury player Stephen Dawson raced clear from the halfway line and fired into the bottom corner. Against the run of play the Shakers pulled a goal back four minutes before half-time via George Miller's deflected shot. Crucially there was still time for Josh Morris to crack the ball home direct from a free-kick and restore the hosts' two-goal advantage. Bury took the game to the Iron after the break and were rewarded when substitute Kelvin Etuhu squeezed a 67th-minute shot inside the post but they could not find an equaliser despite some decent periods of pressure. The Blades took the lead after just three minutes when Ethan Ebanks-Landell headed home Mark Duffy's left-wing cross but the Shrimpers hit back to equalise in the 19th minute when Simon Cox converted from Marc-Antoine Fortune's pass. Both teams were reduced to 10 men in the second half at the County Ground, referee Nigel Miller sending off Shrewsbury debutant Aristote Nsiala before then later red-carding Robins midfielder James Brophy. The game came to life in the 51st minute when Swindon's Luke Norris found himself facing an empty net before being fouled in the area by defender Nsiala, which led to a straight red card. John Goddard stepped up to rifle the penalty past goalkeeper Jayson Leutwiler, who dived the right way but could not prevent the ball rippling the back of the net. Brophy was then given his marching orders in the 70th minute, picking up a second yellow card for a challenge on Freddie Ladapo. Mat Sadler claimed a dramatic equaliser in the 80th minute when his header bounced down off of the underside of the crossbar before the linesman waved his flag to signal it had crossed the line. Flippin’ barmy linesman! That decision cost The Grambler a full house! Should’ve gone to Specsavers! So close and yet so far. Right what has The Grambler randomly picked for us this week? Ooer... That’s a bit too whopping. Teaser time. Yay! Last week I asked you how many games did Portugal win in 90 minutes at the finals of Euro 2016. The answer was one. They beat Wales 2 - 0 in the semi final. They hardly won the tournament in a convincing manner. They got through the group stages by neither winning nor losing a game. They beat Croatia 1 - 0 after extra time in the last 16 stage. They drew 1 - 1 with Poland in the quarter final, but won 5 - 3 in the penalty shootout. In the final the beat France 1 - 0 after extra time. And finally, Cyril? 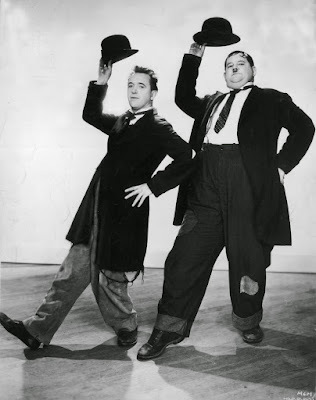 And finally Esther, I am indebted to a Messrs S. Laurel and O. Hardy for this week’s final clip from a film directed by birthday boy Hal Roach. To me, it is the funniest moment from any film they ever made. See if you agree.